At Barnton Community Nursery and Primary School we are passionate about finding opportunities for all our children to excel in Science. Our curriculum aims to inspire each child to achieve their very best, and believe in their hopes and dreams! To do this we provide our children with a rich, broad and balanced curriculum. A curriculum that creates wonder, excitement and magical experiences, which promotes the love of learning, and creates independence and a thirst for knowledge. 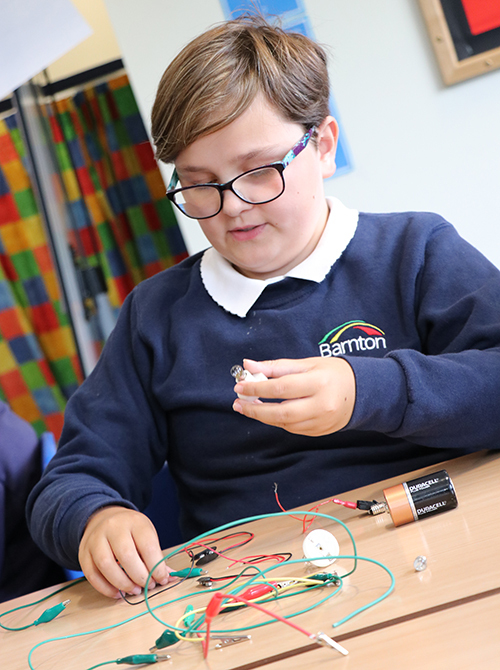 Our pupils love science lessons and we maintain their natural curiosity by teaching them to explore the world around them through lots of first hand experiences. From frogs to forces, our science curriculum provides opportunities for pupils to master their investigative skills whilst building on their knowledge and understanding of science. Workshops, trips and science clubs, as well as outdoor learning experiences in our fantastic school grounds, enhance learning and help to develop enquiring minds. Our aim is always to inspire and equip our pupils to become the scientists of tomorrow.